March 2006 – Dunkin’ Donuts is acquired by the Carlyle Group and two other buyout firms. The Carlyle Group, headquartered on Pennsylvania Avenue between the White House and Capitol Hill, pays George’s daddy for public speeches promoting Carlyle interests. The firm has many strong ties to the Washington establishment as well as to the Bin Ladens and to powerful politicians and businesspeople in Asia and the Middle East. Carlyle’s massive investments in a range of weapons firms, oil corporations and media companies ensure it handsome profits from U.S. military incursions in the Middle East. June 2006 – Dunkin’ Donuts publicizes a new plan to “rapidly expand to nearly 15,000 US locations by 2020,” according to the Boston Globe. 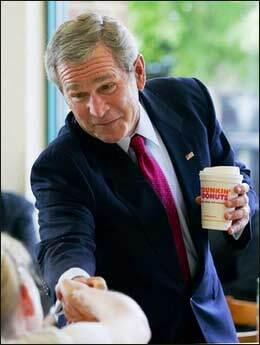 July 2006 – George W. Bush’s handlers arrange a photo opp at a Virginia Dunkin’ Donuts, where George passes out Dunkin’ Donuts products to reporters and carefully poses with the Dunkin’ Donuts logo in plain view. Unkind Donuts, indeed. Webloggers are writing about this; I’d say it’s time for the old-school media to point it out. I hope you dont mind. I posted a link to your fine expose on the Democratic Underground web site. The perfect job for W after January of next year: selling coffee and donuts down the street from the White House.